America's best-selling luxury model just got even more affordable. 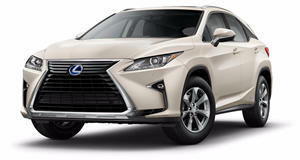 When we the Lexus RX 450h, we weren't surprised that it was the best selling luxury model in the US. The RX hybrid combines an amazing interior with , but we didn't think that the hybrid drivetrain was worth the $10,000 premium over the gas engine model. For 2018, Lexus will fix the pricing issue that we had with the RX hybrid. According to , the 2018 base price for the RX 450h will be $7,340 lower than it was in 2017. Unfortunately, this price cut doesn't come without penalties. The official MSRP for the 2018 RX 450h will be $46,690, including a $995 destination charge. This is a $7,340 decrease from last year's MSRP of $54,030. This means that the hybrid RX is now only $1,025 more than a base gas engine model with AWD. In order to make the RX cheaper, Lexus removed a few standard features that luxury buyers may want. Heated and ventilated leather seats are now optional. The heating and ventilation now requires a $640 package combined with a $1,110 Premium Package. The Premium Package also requires the addition of a $1,350 moonroof, which is no longer standard. The moonroof also adds roof rails, which also used to be standard. Navigation is also optional at a cost of $2,120. Since Lexus and Toyota refuse to integrate Apple CarPlay or Android Auto, the built-in system will be the only way to get navigation in the RX. The 2018 model also cuts out the standard blind spot monitor with rear cross-traffic alert, which now costs $1,065. All together, these options add up to $52,975, which is still $1,055 less than last year's MSRP. After driving the RX, we highly suggest adding all of these options to get the true luxury experience. The RX is already a great luxury car, but a few tiny changes could make it better.